A wedding cake adorned with deep red strawberries or raspberries or pretty blueberries is the ultimate summertime cake. But let’s not forget about the bigger fruits, like peaches or apricots. Used sparingly they can be just as pretty on a cake without weighing it down or looking out of place. Take today’s featured cake. 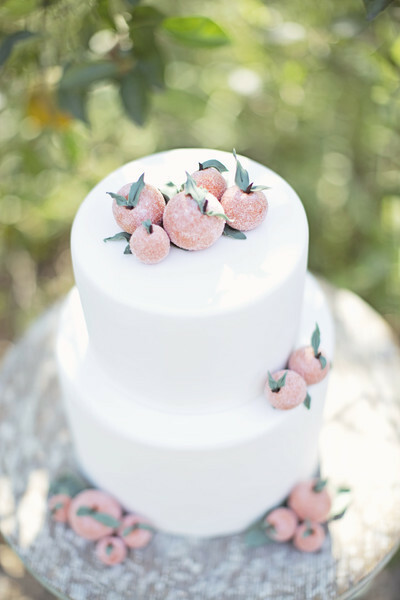 It’s adorned with what looks to be sugar-coated pears and apricots and it is stunning! The sugar coating gives an added touch of elegance to the cake (and the fruit). You can find today’s cake here. It was created by Earth and Sugar.